The Mac is client and the Windows 10 box is the server. synergyc: OpenScripting.framework - can't find entry point InjectEventHandler in scripting addition /System/Library/ScriptingAdditions/SIMBL.osax. Both connected via Wifi on the same network. Windows Firewall is off. The MacOS machine is 10.12.6 and the Windows is Windows 10 64-bit. Below is the shot of the server. I think this has something to do with the fact that SIMBL doesn't exist in MacOS Sierra. 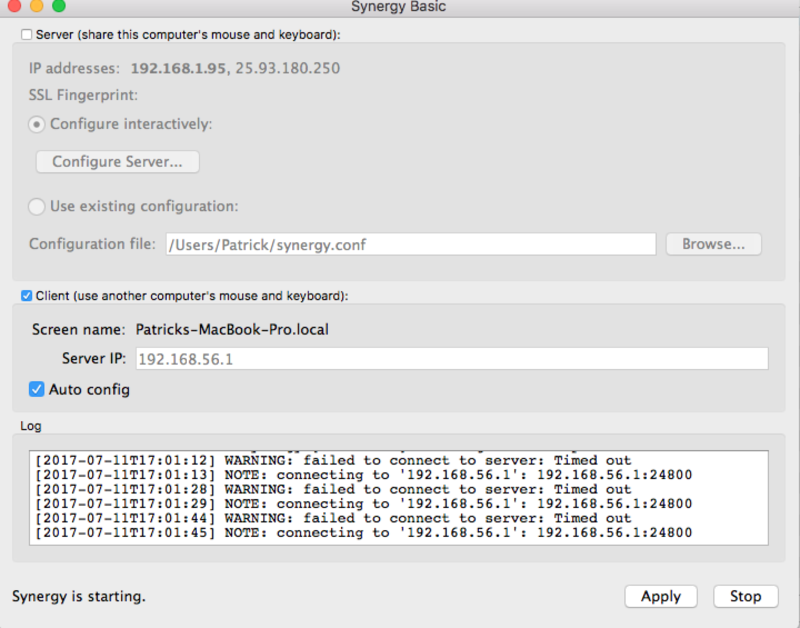 Just downloaded Synergy today, so it's the latest version on both machines. Still waiting for the other screenshots to be posted @Patrick Alexander. I removed the SIMBL plugin I had installed for something else, and I'm not getting that error anymore, but now I'm still getting connection issues. Interestingly enough, it works the reverse way, with the Windows box as the client, but I want the Windows box to be the server. Change the screen name of your mac machine and remove the ".local" on it. Nevermind, I figured it out. It was trying to connect to my VirtualBox Network IP, instead of my actual local IP. When I updated the IP address manually, it works! I see. Thanks for the update @Patrick Alexander. By the way, if you're connected to multiple network interfaces, you can also set the primary network interface where you want Synergy to search or to listen to for the machine(s) you want to have connection with.